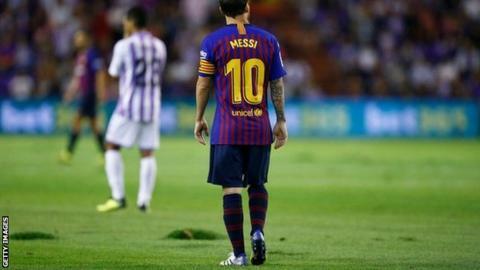 La Liga has opened an investigation into Real Valladolid's "deplorable" pitch following their defeat by Barcelona on Saturday. Players had to replace clumps of turf that became dislodged during the Spanish champions' 1-0 win at the Estadio Jose Zorrilla. The pitch was relaid on Tuesday and began to tear up early in the game. "There were areas that seemed more like a beach," said Barcelona midfielder Sergio Busquets. "It's incredible that no-one from La Liga felt they should come and check the grass. You can't play on that." Barcelona defender Gerard Pique said: "It was deplorable. "I hope those in charge get their house in order and fix this, because it was lamentable." Real Valladolid are playing in La Liga for the first time since 2013-14 after winning promotion via the play-offs last season. Manager Sergio Gonzalez said the club had done "everything they could" to get the pitch ready. "We were the last team to get promoted and we've had issues getting the pitch ready on time," he said.